The FSG 90 and its variants are very high quality transceivers with a reputation for ruggedness and reliability and fit a standard 57mm cut out. The FSG90 and other FSG range products have been in worldwide operation for decades and have gained an excellent reputation for high equipment reliability, long working life cycle and very robust equipment design. 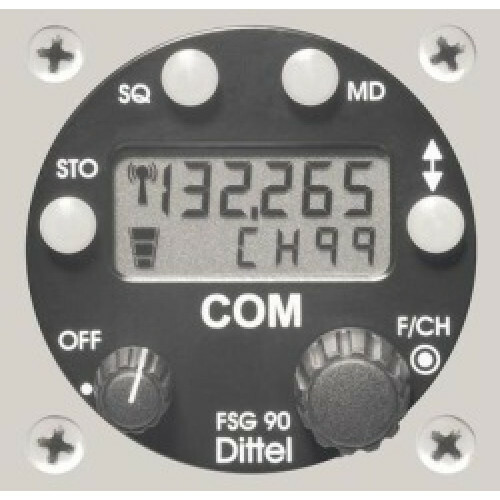 The FSG90 transceiver fulfills the requirements of the regulation of the European Commission of 16 November 2012 with respect to the 8,33 kHz channel spacing, and can be used also in its corresponding base transceiver configuration or for mobile applications (e.g. on-board vehicles). The FSG90 is available as well with extended frequency range (up to 149.975MHz) and with 10 Watt transmit power (normally 6 Watt).